She took particular care in assisting people who, having lived under the norm of nobility with property, found themselves ruined, their necessity and misery increasing, and ashamed to beg. She aided these poor ones with great generosity and with no less secrecy and circumspection so that they enjoyed benefits without the counterpoise of shame. For the sons of poor nobles, she had in the palace special pouches that were prepared in accordance with their elevated position. She gave dowries for marriages to respectable poor maidens and took delight in dressing their hair for their weddings with her royal hands. She had gathered near her and educated many other orphans, daughters of her vassals; when they contracted a marriage, she dowered them abundantly, and she adorned them with her jewels on the wedding day. 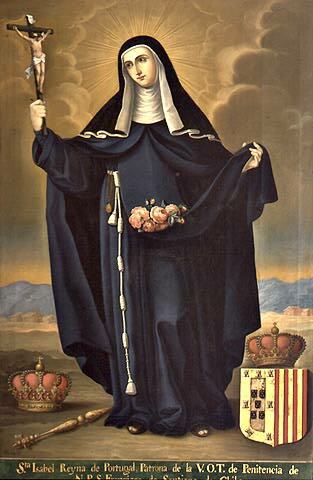 And so that her refinement of goodness would not end with her life, she established a trust in her monastery of Santa Clara for dowries for noble orphans and left instructions that part of the jewels she bequeathed to this convent be lent to these young ladies for their bridal adornment. J. Le Brun, Santa Isabel, Rainha de Portugal (Porto: Livraria Apostolado da Imprensa, 1958), pp. 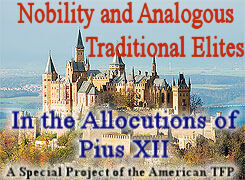 127-128 in Plinio Corrêa de Oliveira, Nobility and Analogous Traditional Elites in the Allocutions of Pius XII: A Theme Illuminating American Social History (York, Penn. : The American Society for the Defense of Tradition, Family, and Property, 1993), Documents III, p. 468.